in fact it is a kind of understatement to name this dish a fish soup, because it is a soup and a main course in one. 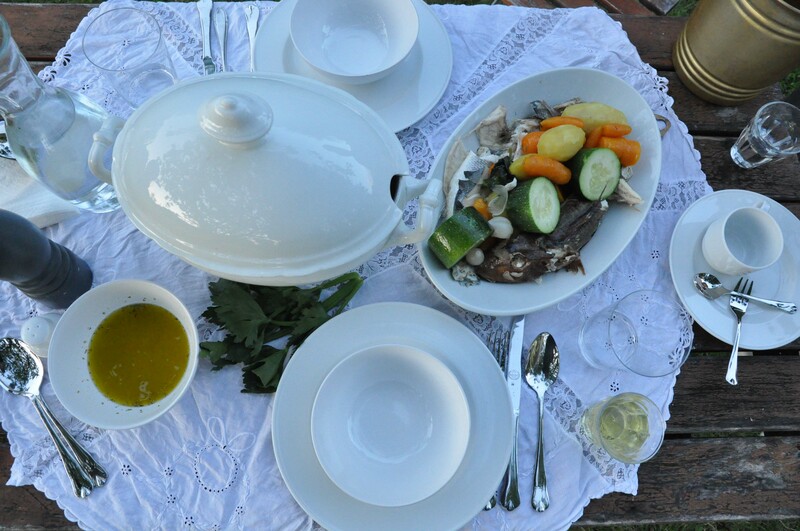 you will cook your ingredients for the main course, fish, potatoes, carrots and courgette, in a broth and the delicious broth will become, due to some lemon juice, your soup. the flavor of lemon and oregano will add the very special summer day character. first time we cooked this soup was during our honeymoon trip to santorini. we rented an absolutely fabulous windmill there and enjoyed our peaceful togetherness. and we cooked us through our greek cookbook. there are dishes, such as this one, which are highly associated with special times or events. that´s why i decided to share this soup for the “urlaub auf dem teller” food-blog-event and also because we currently have tons of carrots, potatoes and some courgettes in our garden. bring 1,5 liter water mixed with 200 ml olive oil to a boil. let it cook for 2 minutes to allow to combine oil and water. add the fish, potatoes, carrots, onions, celery, courgette and a little bit of salt. let it simmer for about 20 minutes, but be careful not to overcook the fish, it will fall to pieces otherwise. for smaller fishes i recommend to add them a little bit later. remove all the ingredients from the pan and arrange on a serving plate. keep warm. season to taste the broth with salt, pepper and the juice of one lemon. the last step is a sauce for the fish. therefore combine some olive oil, juice of one lemon and the oregano. i prefer to eat soup, fish and vegetables at the same time. but you can also start with the soup and continue with the fish and the vegetables. some rustic white bread will be perfect. and to get the perfect greek holiday feeling you need some greek white wine, ideally a very cold retsina. jamas (cheers) and enjoy the meal. in einem großen topf 1,5 liter wasser und 200 ml olivenöl zum kochen bringen. ein paar minuten kochen, bis sich öl und wasser miteinander verbunden haben. fisch, kartoffeln, karotten, sellerie, zucchini, zwiebeln und etwas salz dazu geben. etwa 20 minuten köcheln lassen, aber vorsicht, den fisch nicht zu lange kochen, da er sonst zerfällt. kleine fische sollte man etwas später als die übrigen zutaten dazu geben. alle zutaten aus dem topf nehmen und auf einer servierplatte arrangieren und warm stellen. die brühe mit salz, pfeffer und dem saft einer zitrone abschmecken. zuletzt wird die sauce für den fisch gemacht. dazu etwas olivenöl, den saft einer weiteren zitrone und den organo miteiander verrühren. ich esse am liebsten die suppe, den fisch und das gemüse gleichzeitig. man kann aber genauso gut mit der suppe beginnen und dann fisch und gemüse essen. ein rustikales weißbrot passt sehr gut dazu. um das perfekte griechische feriengefühl zu bekommen, braucht es unbedingt ein glas weißwein, am besten einen gut gekühlten retsina. jamas (prost) und guten appetit! This entry was posted in recipes, summer and tagged carrot, celery, courgette, fish, onion, potatoes, soup by The Cook. Bookmark the permalink. Oh, vielen Dank. Ich liebe die griechische Küche. Und wenn ich das lese, sehe ich mich tatsächlich auf einem Inselchen am Meer sitzen.